Although its sporty flair seemed to shrink with each washing, the second-generation Buick Riviera was a solid success, selling 227,669 units in five model years. It only beat the Thunderbird once, but Riviera sales were very close to the combined total of the Toronado and FWD Eldorado (although it must be said that the Eldorado’s lower numbers were mainly due to its deliberately limited production). GM’s accountants undoubtedly also appreciated that the tooling costs of the E-body shell could be amortized over 465,436 cars rather than fewer than 113,000. While the second-generation Riviera may have been far less innovative than the Toronado in either styling or engineering, it was inarguably a much greater commercial success: the Toronado sold only 143,134 units in five years, less than two-thirds of the Riviera’s volume. The Riviera did have the advantage of an already-established image — when the 1966 Riviera arrived, buyers already knew exactly what a Riviera was and how it fit into the Buick lineup — but even if the Riviera and Toronado had sold equally well, the Riviera would still have been the cheaper to build and probably the more profitable to boot. 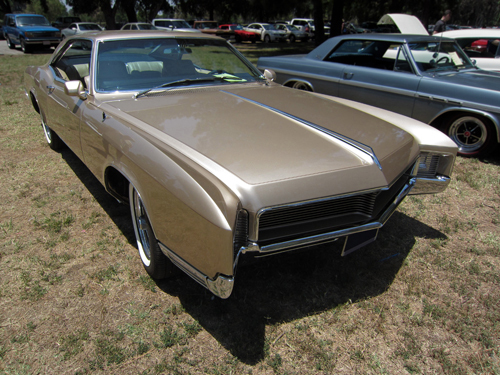 Another look at the 1966 Buick Riviera. With results like that, it’s little wonder that Buick (and GM) didn’t rush to adopt front-wheel drive in this era or that the corporation had an ambivalent attitude toward new technology even when it didn’t have any specific crippling flaws. The Unitized Power Package was very clever and it worked quite well, but it didn’t work dramatically better than a standard rear-drive layout (except in specific areas like wet traction). Toronado and Eldorado buyers did appreciate their cars’ front-wheel drive, but many Toronado owners wished Oldsmobile would offer it on something other than a big coupe while a lot of Cadillac customers admitted that they were drawn more to the Eldorado’s sharp looks than its mechanical configuration. General Motors was certainly not categorically opposed to novelty, but the corporation was obviously more interested in innovations that would either sell cars or save money and front-wheel drive (in and of itself) did neither. GM did stay the course with the E-bodies if only to get its money’s worth; the Unitized Power Package survived through 1985. By 1972, the second-generation Toronado was consistently outselling the Riviera — thanks mostly, we suspect, to the new Toro’s pronounced resemblance to the outgoing Eldorado. The Riviera finally adopted front-wheel drive for 1979, when assembly of the E-bodies was consolidated at the GM plant in Linden, New Jersey. The first FWD Riv would be the most successful of all, although it was not until 1984 until it beat the record set by the 1969 Riviera. By then, of course, front-wheel drive was no longer seen as exotic engineering. With all this talk of corporate psychology, we shouldn’t lose sight of the fact that the second-generation Riviera was an exceptionally good-looking design. The later facelifts are not to our tastes, but the 1966-1967 version is quite sharp. Dave Holls said later that it was one of his favorite designs of the sixties and we wholeheartedly agree. The author would like to thank Kathy Adelson of the GM Media Archive for her assistance with archival images for this story. Our sources on the development of the Riviera and its E-body siblings included “1961 Buick Analysis,” Motor Life, November 1960 (Vol. 10, No. 4), reprinted in R.M. Clarke, ed., Buick Performance Portfolio 1947-1962 (Cobham, England: Brooklands Books Ltd., ca. 2000), pp. 108-109; “Autocar Road Test Number 2036: Buick Riviera,” Autocar, July 1965, reprinted in R.M. Clarke, ed., Buick Riviera 1963-78 Performance Portfolio (Cobham, England: Brooklands Books Ltd., ca. 2000), pp. 43-48; the Auto Editors of Consumer Guide, “1961-1964 Cadillac” (16 September 2007, HowStuffWorks.com, auto.howstuffworks. com/ 1961-1964-cadillac.htm, accessed 18 June 2012), “1965-1967 Buick Gran Sport” (25 September 2007, HowStuffWorks.com, auto.howstuffworks. com/ 1965-1967-buick-gran-sport.htm, accessed 12 June 2012), “1966-1970 Buick Riviera” (29 October 2007, HowStuffWorks.com, auto.howstuffworks. com/ 1966-1970-buick-riviera.htm, accessed 15 June 2012), and Encyclopedia of American Cars: Over 65 Years of Automotive History (Lincolnwood, IL: Publications International, 1996); Patricia Ward Biederman, “The Man Who Couldn’t Part With a Car Brochure,” Los Angeles Times, 10 January 2002; Ray Bohacz, “Light my fire! 1967 Buick Wildcat 430-cubic-inch V-8,” Hemmings Classic Car #23, August 2006; John R. Bond, “Road Test & Technical Review: 1963 Buick Riviera,” Car Life, October 1962 (Vol. 9, No. 9), reprinted in Clarke, ed., Buick Riviera 1963-78 Performance Portfolio, pp. 6-11; Jim Brokaw, “Almost a Limousine,” Motor Trend, December 1970 (Vol. 22, No. 12), reprinted in ibid, pp. 103-107; Arch Brown, “1966 Thunderbird: ‘Big Bird,'” Special Interest Autos #106, July-August 1988, reprinted in Terry Ehrich, ed., The Hemmings Motor News Book of Postwar Fords (Bennington, VT: Hemmings Motor News, 2000), pp. 120-127; “Buick Riviera,” Car and Driver, October 1969 (Vol. 15, No. 4), reprinted in R.M. Clarke, ed., Buick Muscle Cars 1963-1973 (Cobham, England: Brooklands Books Ltd., ca. 2001), p. 99; “Buick Riviera,” World Automotive, 1968, reprinted in Clarke, ed., Buick Riviera 1963-78 Performance Portfolio, p. 96; “Buick Riviera: beauty only skin deep?” Road Test, July 1966, reprinted in ibid, pp. 64-69; “Buick Riviera Gran Sport,” Car and Driver, June 1965 (Vol. 10, No. 12), reprinted in ibid, pp. 38-42; “Buick Riviera GS,” Car and Driver, August 1966 (Vol. 12, No. 2), reprinted in Clarke, ed., Buick Muscle Cars 1963-1973, pp. 56-59; “Car and Driver Road Research Report: Buick Riviera,” Car and Driver, December 1963 (Vol. 9, No. 6), reprinted in Clarke, ed., Buick Riviera 1963-78 Performance Portfolio, pp. 23-29 and 55; “Car Life Road Test: Chevrolet Impala SS,” Car Life March 1965 (Vol. 11, No. 6), reprinted in Impala & SS Muscle Portfolio 1958-1972, ed. R.M. Clarke (Cobham, England: Brooklands Books Ltd., ca. 1996), pp. 71–75; “Car Life Road Test: 1965 Ford Thunderbird,” Car Life, November 1964 (Vol. 11, No. 2), reprinted in R.M. Clarke, ed., Thunderbird Performance Portfolio 1964-1976 (Cobham, England: Brooklands Books Ltd., ca. 2000), pp. 37-41; “Car Life Road Test: Buick LeSabre 400: A Budget-Priced, Conservative Luxury Car,” Car Life, January 1965 (Vol. 11, No. 12), reprinted in Clarke, ed., Buick Muscle Cars 1963-1973, pp. 33-37; “Car Life Road Test: Oldsmobile Toronado,” Car Life, February 1966 (Vol. 12, No. 5), reprinted in R.M. Clarke, ed., Oldsmobile Muscle Portfolio 1964-1971, pp. 43-47; “Car Life Road Test: Riviera Gran Sport,” Car Life, February 1966 (Vol. 13, No. 1), reprinted in Clarke, ed., Buick Riviera 1963-78 Performance Portfolio, pp. 56-61; “Car Life Road Test: Riviera: A Superb Combination of Styling, Performance, Ride and Comfort,” Car Life, November 1967 (Vol. 14, No. 10), reprinted in ibid, pp. 85-89; “Car Life Road Test: Riviera for the Freeways,” Car Life, February 1969 (Vol. 16, No. 1), reprinted in ibid, pp. 91-95; “Cars Road Test: Buick’s Riviera GS Is the Grandest Sport of Them All!” Cars, October 1967, reprinted in Clarke, ed., Buick Muscle Cars 1963-1973, pp. 75-78 and 105; “Driving the Hot ’67s: Buick Riviera,” Motor Trend, October 1966 (Vol. 18, No. 10), reprinted in Clarke, ed., Buick Riviera 1963-78 Performance Portfolio, p. 77; “Cole, Edward N.,” Generations of GM, GM Heritage Center, no date, history.gmheritagecenter. com, accessed 22 June 2012; Terry B. Dunham and Lawrence R. Gustin, The Buick: A Complete History (An Automobile Quarterly Magnificent Marque Book), Third Edition (Kurtztown, PA: Automobile Quarterly, 1987); Jim Dunne and Jan P. Norbye, Buick 1946-1978: The Classic Postwar Years (Osceola, WI: MBI, Inc./Motorbooks International, 1978, 1993, Second Edition); John Ethridge, “5 Luxury Specialty Cars,” Motor Trend, August 1967 (Vol. 19, No. 7), reprinted in Clarke, ed., Buick Riviera 1963-78 Performance Portfolio, pp. 78-83; Darwin Falk and Ray Knott, “What is a Gran Sport/G.S./Stage 1?” The Riview, rivowners. org, accessed 11 June 2012; Craig Fitzgerald, “The Lost Riv: 1966-1970 Buick Riviera,” Hemmings Motor News, January 2010; John Gunnell, ed., Standard Catalog of American Cars 1946-1975 Revised 4th Edition (Iola, WI: Krause Publications, 2002); Bill Hartford, “Too Rough a Ride for the Soft Life,” Popular Mechanics, July 1969 (Vol. 131, No. 7), pp. 122-125; Tim Howley, “driveReport: 1958 Thunderbird: Flying Off in a New Direction,” Special Interest Autos #151, January-February 1996, reprinted in Ehrich, ed., The Hemmings Motor News Book of Postwar Fords, pp. 86-94; John F. Katz, “SIA comparisonReport: 1966 Oldsmobile Toronado vs. 1967 Cadillac Eldorado: The Front Line of Front-Wheel Drive,” Special Interest Autos #168, November-December 1998, reprinted in Terry Ehrich, ed., The Hemmings Motor News Book of Cadillacs (Hemmings Motor News Collector-Car Books) (Bennington, VT: Hemmings Motor News, 2000), pp. 110-119; Steve Kelly, “Mister Muscle of 1970,” Hot Rod, November 1969 (Vol. 22, No. 11), reprinted in Clarke, Buick Muscle Cars 1963-1973, pp. 96-98; Ray Knott, “Evolution of the Riviera – 1966,” The Riview, July-August 2002 (Vol. 18, No. 5); “Evolution of the Riviera – 1967,” The Riview, September-October 2002 (Vol. 18, No. 6); “Evolution of the Riviera – 1968,” The Riview, November-December 2002 (Vol. 18, No. 7); “Evolution of the Riviera – 1969,” The Riview, January-February 2003 (Vol. 18, No. 8); and “Evolution of the Riviera – 1970,” The Riview, March-April 2003 (Vol. 18, No. 9), rivowners. org, accessed 11 June 2012; David LaChance, “Buyer’s Guide: 1966-’67 Buick Riviera GS,” Hemmings Muscle Machines #34, July 2006; Michael Lamm, “PM Owners Report: Buick Riviera,” Popular Mechanics, September 1970 (Vol. 134, No. 3), pp. 96- 99, “The Car You Wear: 1963 Buick Riviera,” Special Interest Autos #33 (March-April 1976), reprinted in Terry Ehrich, ed., The Hemmings Book of Buicks (Hemmings Motor News Collector-Car Books) (Bennington, VT: Hemmings Motor News, 2001), pp. 94-100, “Toronado Owners Really Dig FWD but say Gas Mileage a Bummer,” Popular Mechanics, June 1970 (Vol. 133, No. 6), pp. 118-121, and “Toro & Cord: So different and yet so much alike!” Special Interest Autos #35, July-August 1976, reprinted in Terry Ehrich, ed., The Hemmings Book of Oldsmobiles (Bennington, VT: Hemmings Motor News, 2001), pp. 100-107; Michael Lamm and Dave Holls, Century of Automotive Style: 100 Years of American Car Design (Stockton, CA: Lamm-Morada Publishing Co. Inc., 1997), pp. 181-184; Richard M. Langworth, James M. Flammang, and the Auto Editors of Consumer Guide, Great American Cars of the ’60s (Lincolnwood, IL: Publications International Ltd., 1992); “Letourneur & Marchand Delage D8-120 Aerosport Coupe” (no date, Coachbuild , coachbuild. com, accessed 24 June 2012); Matthew Litwin, “Clamshell Elegance,” Hemmings Motor News, June 2007; Robert McVay, “Buick Riviera GS Road Test,” Motor Trend, February 1966 (Vol. 18, No. 1), reprinted in Clarke, ed., Buick Riviera 1963-78 Performance Portfolio, pp. 62-63, and “Mustang Road Test: Ford’s top-performance Mustang has quarter-horse agility, race-horse stamina, show-horse style,” Motor Trend, August 1964 (Vol. 16, No. 8), pp. 44-49; “Oldsmobile Toronado: The Most Carefully Engineered and Thoroughly Tested Car,” Car Life, November 1965 (Vol. 12, No. 2), pp. 28-37; Productioncars.com, Book of Automobile Production and Sales Figures, 1945-2005; “Riviera Gran Sport,” Road & Track, February 1966 (Vol. 17, No. 6), reprinted in Clarke, ed., Buick Muscle Cars 1963-1973, pp. 44-47; “Car Life Road Test: 1965 Ford Thunderbird,” Car Life, November 1964 (Vol. 11, No. 2), reprinted in Clarke, ed., Thunderbird Performance Portfolio 1964-1976, pp. 37-41; “Toronado vs. Riviera,” Cars, September 1966, reprinted in Clarke, ed., Buick Riviera 1963-78 Performance Portfolio, pp. 70-76; C. Van Tune, “Retrospect: Riviera: 1963–1973 Buick Riviera,” Motor Trend Vol. 46, No. 1 (January 1994), reprinted in ibid, pp. 130–132; Daniel Vaughan, “1936 Delage D8-120” (2007, 2010, Conceptcarz.com, www.conceptcarz. com, accessed 24 June 2012); a comment from stylist John Houlihan on “Buick Riviera Boattail 1971 1972 1973” (18 July 2000, Buick-Riviera.com, www.buick-riviera. com/ houlihan_history.html, accessed 13 June 2013); and a letter by John Houlihan to the editors of Collectible Automobile, reprinted with permission by Gary Smith in “Who Designed the ’71 Boattail Riviera?” (25 July 2010, Dean’s Garage, deansgarage. com/ 2010/ who-designed-the-%E2%80%9971-boattail-riveria/, accessed 13 June 2013).